I'm part of The Journey to Star Wars: The Last Jedi! As announced in Entertainment Weekly's article and at Comic-Con International: San Diego, I'm one of four authors giving viewers a look at Canto Bight, the playground for the rich seen in this December's Star Wars: The Last Jedi. 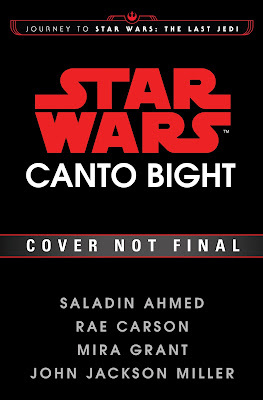 Star Wars: Canto Bight releases as a hardcover, audiobook, and ebook on December 5, a week before the film opens. The B&N links still use the book's pre-publicity code-name, but will be replaced with the correct title shortly. I am also sure there will be Audible, Indiebound, and iTunes links before long. I have created a page for the book here on the site when more information is available. There's also a page now with preorder links and information for October's Star Wars: From a Certain Point of View. That one's getting an audiobook too. In other news from San Diego, I've always been delighted whenever the Marvel Cinematic Universe draws from my Iron Man comics — mainly, because the nature of the storyline meant that I introduced very few super-powered characters who might be drawn upon. So I was tickled when years after my first Iron Man story arc, "The Best Defense," was released, the reporter I introduced, Christine Everhart, appeared in a prominent role in the first Iron Man movie (where she was played by Leslie Bibb) and later appeared in the sequel and various official web videos. Turns out that storyline has been tapped again: the villain from that arc, Sonny Burch, was named by Marvel at San Diego as one of the principal characters in next year's Ant-Man & The Wasp. Burch in my story was a former Cross Technologies exec who went to work for the Pentagon, where he used patent law to legally seize all Tony Stark's Iron Man armor technology for the government; in my story, Tony decided the only way to regain control would be to serve as Secretary of Defense, which he eventually did, thwarting Burch. Tony would hold that position for my 2003-4 run on the book. Walton Goggins of "Justified" and "Hateful Eight" will play an apparently much younger Burch, who's associated again with Cross Technologies, which we saw in the first Ant-Man film. It's fun seeing that original story's characters turning up years later. Click to read more about the "Best Defense" arc.